When nothing else revives your soul, your baptism stands and makes you whole and then in death completes you. To you, ambassadors of Christ, reconciled to God, grace to you and peace from God our Father and Lord Jesus Christ. Amen. Dust in and of itself is not a bad thing. We are from dust. It is from the dust of the ground that the Lord got His hands dirty and formed our bodies, creating Adam and Eve. The body of creation, the body of perfection is merely dust formed by God and given the breath of life. The problem with the ash and dust is that we return to it. It’s a reality we face all the time. It’s the fear and concern for most of our prayer list, returning to dust, that is dying. It is in this way that we begin the next 40 days of Lent, 40 days leading to the death and resurrection of Christ. It is not for the sake of our own self pity that we come, but in humble repentance that we are dust, we sin, we will return to the dust, and we need a Savior for life. For most of us, acknowledging our sin is fairly easy. We all know that we sin in thought, word, and deed. Do we occasionally lie? Sure, but those white lies hurt no one right? So we may have hatred in our heart towards our neighbor but as long as I act nicely towards him no one will care. We might even covet our fellow church members’ homes, cars, family, health, or other things but as long as we don’t act jealous or say anything no one will know. We have no problem acknowledging our sin, at least in part. I suspect likewise that given the opportunity to write your sins out and give them to me with some sort of symbolic gesture of nailing them on a cross on Good Friday that you might be tempted to outdo one another to create a grander show and create a really long laundry list of sin. But there is one sin almost no one wants to admit or confess. Our love for ourself. Even when we practice good things, like confession, we feel good about it because in some small way we think we contribute to our forgiveness and salvation before God. We like the adage then that confession is good for the soul. That’s true, in part. But only in part. It is good for the soul for with it is the word of Christ, the word of absolution. Dear Christians, you see, there is a morsel of hypocrisy in all of us, okay, maybe more than a morsel. We do practice our righteousness before others. We like to sound a trumpet and be praised by others when we give to the needy. We want everyone to know how good we are in generosity. When we pray, we like others to know it. Sadly, we want to look down on those we think don’t. And when we fast, or when we give up something for Lent, we like to tell everyone about it that they may know how devout and holy we are and that we take Lent seriously. While these are good things, they don’t save you nor do they earn any part of salvation. These Lenten disciplines of giving, praying, and fasting are good things but they are not your salvation. You see, these things are signs and fruits of repentance and faith. These are things that teach us to not love ourselves. That we can give more generously to those without as we love our neighbor by aiding to provide for them, that we can and ought to pray more, and that we can fast for a short time for man does not live by bread alone but by every Word that comes from the mouth of God. There can be a goodness in these disciplines of giving things up for Lent, practicing a fast in a small way, in so far as it teaches us to deny our sinful flesh and desires and leads us here in repentance and faith in the one who provides for our salvation. We don’t give things up for Lent or fast to show how faithful we are, but to live by faith. “Where your treasure is, there your heart will be also.” Jesus speaks about giving, praying, and fasting, He speaks of denying ourselves to follow Him. We seemingly can’t give up that food for a day, or television, or electronic, or other enjoyable activity. Not that any of those things are bad in and of themselves, they are not. But where they take root in our heart and become our treasure they push out the Lord and His gifts of faith and love. We can’t give up a sporting event or other activity but we can give up prayer, Divine Service, and Bible study. We can come and receive ashes on our head but we can’t repent of that favorite pet sin that clings in our life. We don’t celebrate and come to Ash Wednesday just to receive ashes on our head. We come because of that which we are marked, the cross. It is the same given to you in baptism, placed upon your forehead and upon your heart to mark you as one redeemed by Christ the crucified. This is why we are here. Dust we are and to dust we shall return. But we are never left in the dust. Our Lord never left Adam and Eve in the dust of death. In confessing our sin we are never left with the condemnation of death. Dust we are and to dust we shall return. These are committal words, funeral words. They are spoken in our funeral services. They are spoken to you tonight. Because you’ve died. Died with Christ. Been buried with Him in baptism. They are the words proclaimed at our funerals for the person is not in eternal death but awaiting the resurrection of the body. What you receive in the dust on your forehead is not just a little dust. It is the burnt palms from last year’s holy week celebration. Over and over again, in many and various ways here in the Lord’s church He gives you His cross and passion. It is what all of Lent, and really of the church year, points us to and leads us. Christ’s cross and passion. The laments and somberness of Lent, the repentance in which we are to daily die and rise, is to lead us to receive the absolution, the forgiveness of sins. Focus on the things of the world a little less, give something up or don’t, but do so always receive the gifts of Christ. To you dear saints at Bethlehem, you have received your reward. For the One who marks with His cross has declared you forgiven. The One who has baptized you, has done so through His death which alone accomplishes forgiveness and gives you life in resurrection glory. Dust we are and to dust we shall return, but there we will not remain. Behold, you will be satisfied in the body and blood of Christ who places the fruit of that cross marked upon your forehead and heart and places it into your mouth. As you return home, you will see that ash and see that cross. You will inevitably wash it off. Please do. And in doing so, consider making the sign of the cross and remembering your baptism which washes away your sin. Remembering this Lenten season to that which we are preparing and that which this leads up to, Holy Week, Christ’s cross and passion, His death and resurrection. There is your reward in heaven. Amen. 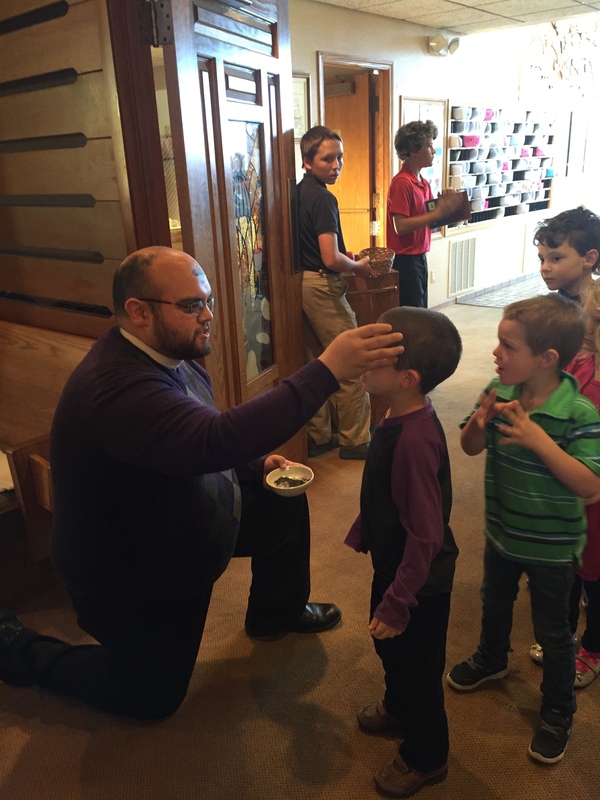 This entry was posted in Ash Wednesday, Baptism, Lent, resurrection, sermon. Bookmark the permalink.